The red variety comes from France. Around 300 Synonyms testify to the old age and worldwide distribution in almost all wine-producing countries, Important or historically significant alphabetically grouped by country are for example Augustiner, Auvernas, Blue Klevner, Pinot Noir, Frühschwarzer, Klävner, Klebroth, Klevner, carrots, Moréote, Pinot Blanc, Schwarzer, Schwarzer Burgunder, Schwarzer Traminer, Pinot Noir, Süßrot ( Germany ); Auvernat, Auvernas, Auvergnat, Berligout, Bourguignon, Clevner, Formentin Noir, Morillon Noir, Mourillon, Noble Joué, Noirien Franc, Noirien Noir, Orléanais, Pignola, Pignolet, Pineau de Bourgogne, Pineau de Bourgoyne, Pineau de Chambertin Pineau Noir, Pineau de Gevrey, Plant Doré, Vert Doré ( France ); Pinot Nero ( Italy ); Cerna, Pino Ceren, Pino Fran, Pino Negru, Pino Nero ( Moldova ); Pinot Noir, Blue Burgundy, Blue Klevner, Clevner, Klevner, Pinot Blanc, Black Burgundy ( Austria ); Pinot Cernii, Pinot Cherny ( Russia ); Pinot Noir, Burgundy, Clevner, Cortaillod, Dôle, Klävner, Klevner, Salvagnin Noir, Savagnin Noir ( Switzerland ); Burgundské Modré, Rulandské Modré ( Slovakia ); Rulandské Modré, Burgundy Modré ( Czech Republic ); Kekburgundi, Kisburgundi ( Hungary ); Black Burgundy, Franc Pineau, Gamay Beaujolais ( United States ). It may, despite seemingly suggestive synonyms or morphological or name similarities not with the varieties Béclan. Blauburger. Blaufränkisch. Brun Fourca. Gamay (Dole), Gouget Noir. Persan. Pineau d'Aunis. Tressot Noir or Trousseau Noir be confused. It is most likely the Pinot Ursorte with many game types or. Clone and mutations, According to 2000 done DNA analysis exists one Parent-offspring relationship between Pinot (see there in detail) and Traminer (Savagnin Blanc). Specifically, Traminer is assumed to be a descendant of Pinot, although the inverse relationship can not be ruled out. The old synonym Black Traminer points to this relationship, although at the time when this name originated, of course, no concrete knowledge existed. 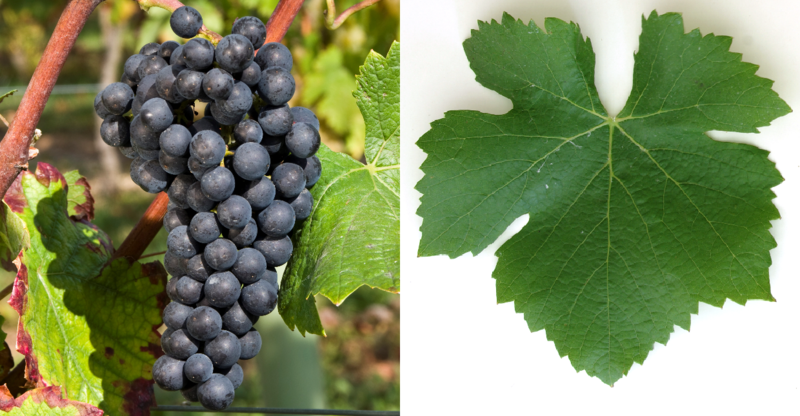 Somatic mutations are Pinot Meunier (Black Riesling) and Samtrot although the latter sometimes also counts as a mutation from the former. It is a very old variety that may have existed for 2,000 years (see also under Pinot ). About the date / year, when Pinot Noir first mentioned or emerged in the individual countries, there are countless sources / variants with often different dates. The mentions related to the 9th century Charlemagne (742-814) must be considered legends (but can not be excluded) because it is unclear which grape varieties were meant exactly. Anyway, it is one of the classic Franconian varieties and could have been spread with the Traminer (Savagnin Blanc) during the time of the Frankish kingdom. Reliable annual figures are in France 1283 (Moreillon) and 1375 (Pinot Vermeil), in Germany 1470 (Clebroit = Klebroth) in the community Hattenheim im Rheingau, in Switzerland in 1766 (Cortaillod) and in Austria, Hungary and Italy the 18th century. The German name Spätburgunder is actually misleading, because it is an early ripening variety. The "late" is a demarcation to about two weeks earlier ripening Frühburgunder (Mutation from Spätburgunder). The vine is sensitive to late frosts, as well as prone to Verrieseln, both mildews. Botrytis and viral diseases, It thrives best in relatively cool climates. Ideally, Burgundy and comparable areas at higher altitudes, such as those in Europe in parts of Germany and Switzerland, as well as overseas in Canada, Oregon, California (Carneros, Sonoma, Central Coast), New Zealand and Australia (Victoria, Tasmania) occurrence. It produces full-bodied, ruby-red-purple red wines with harmonious acidity and tannin levels, as well as varietal, fruity aromas of berries and bitter almonds. The variety is particularly suitable, the specific terroir because they are very sensitive to differences soil type and microclimate reacts. In Burgundy Pinot Noir is the dominant red wine variety, this fact has many differently classified parcels or the system of Burgundy classification guided. In the 19th century, the variety developed as the basis for the very large Burgundy wines such. B. from Domaine de la Romanée-Conti at the Côte d'Or, On Romanée-Conti Vintage 1990 of this winery counts with $ 28,112 for a bottle at one auction in 1996 Sotheby's to the most expensive wines in the world, in the Burgundy are planted ~ 10,500 hectares. In the Champagne The variety occupies ~ 13,000 hectares, which is about 30% of the vineyard. There he is white pressed ( Blanc de noirs ) and is next Pinot Meunier and Chardonnay important component of the finest champagne, in the Alsace This means that 3,758 hectares are planted. The French acreage totaled 29,738 hectares. Outside France, Pinot Noir is represented in almost every wine-growing country in the world. In Germany occupies the variety as Blauer Spätburgunder with 11,733 hectares of vines the first place among the red varieties and is particularly in the growing areas Ahr. to bathe. palatinate. Rheinhessen and Wuerttemberg widespread. In the Switzerland Pinot Noir is the most common grape variety and covers about one third of the total area with 4,402 hectares. In Sierre in the canton Wallis is annually the international wine competition Mondial du Pinot Noir organized. In Austria are under the name Blauburgunder 649 hectares planted with rising tendency. Other countries in Europe or North Africa are Algeria (1,510 ha), England (233 ha), Israel (10 ha), Italy mainly in South Tyrol (5,046 ha), Kazakhstan (180 ha), Croatia (180 ha), Luxembourg (3 ha), Moldova (6,521 ha), Portugal (148 ha), Romania (1,089 ha), Russia (533 ha), Spain (1,044 ha), Czech Republic (688 ha), Turkey (3 ha), Ukraine (767 ha) and Hungary (1,091 ha). In the United States In 2004, the movie "Sideways" unleashed a veritable Pinot Noir boom California (two couples visit California wineries, enjoy wine and philosophize about it). Here it is grown on a total of 15,091 hectares; especially in the Sonoma County and Monterey County, Other US states are Idaho. Michigan. New Mexico. new York (136 ha), Oregon. Texas (28 ha) Virginia and Washington (127 ha). In total, the US yielded 16,676 hectares. This page was last modified at 20 February 2019 at 08:43.